The University Grants Commission (UGC) has come up with the list of 21 ‘fake’ universities operating out of different parts of the country. The maximum numbers of such universities are from Uttar Pradesh followed by Delhi. “Students and public at large are hereby informed that the UGC has identified 21 self styled, unrecognized institutions in nine states, which are functioning in contravention of the provisions of the UGC Act. All these institutions have been declared as fake and do not have any right to confer degree,” UGC said. 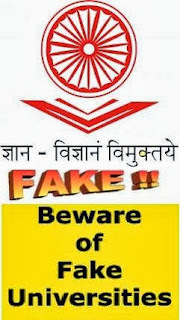 There are nine universities from Uttar Pradesh that have been declared fake, the universities are Varanaseya Sanskrit Vishwavidyalaya, Varanasi; Mahila Gram Vidyapith (Women’s University) Allahabad; Gandhi Hindi Vidyapith, Allahabad; National University Of Electro Complex Homeopathy, Kanpur; Netaji Subhas Chandra Bose Open University, Aligarh; Uttar Pradesh Vishwavidyalaya, Mathura; Maharana Pratap Shiksha Niketan Vishwavidyalaya, Pratapgarh; Indraprastha Shiksha Parishad, Noida and Gurukul Vishwavidyalaya, Mathura. The UGC has put Bharatiya Shiksha Parishad in the list but with a note that the matter is subjudice. There are five universities from Delhi in the list of fake universities; the universities are Commercial Universities Ltd, United Nations University, Vocational University, ADR Centric Judicial University and Indian Institute of Science and Engineering. Mithila University from Darbhanga is the only university from Bihar in the list of fake universities published by the commission. Badaganvi Sarkar World Open University run by the Badaganvi Sarkar World Open University Education Society operating out of Gokak in Belgaum is the university from Karnataka in the list. St. John’s University from Kishanattam in Kerala is the one university from the state in the list. Madhya Pradesh also has one university, Keserwani Vidypith among the list of 21 fake university published by the UGC. Raja Arabic University from Nagpur is the one university from Maharashtra among 21 fake varsities. DDB Sanskrit University from Putur area in the Trichi district of Tamil Nadu is the only one university from Tamil Nadu. Indian Institute of Alternative Medicine from Kolkata is the one institution from the state of West Bengal in the list of ‘fake university’.